Ben joined the Flex Out team in 2017 after graduating from the University of Canberra in 2016. In his first couple of years as a Physiotherapist, Ben has gained experience working with a wide variety of populations. He has spent the large majority of his time in private practice, where he has been exposed to areas such as sporting rehabilitation, osteo-arthritis management, chronic lower back pain management, pre/post-operative rehabilitation and falls prevention. Ben represents the Belconnen Magpies in the local AFL Canberra competition, and has worked as a sports trainer for local sporting teams over the past 5 years. With his experiences being both a player and a clinician, Ben fully understands what is required to make a successful return to sport following an injury. 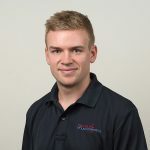 Ben has also done further professional training in areas of knee/hip osteoarthritis management, and has strong interests in lower back pain and shoulder injury management. He uses a combination of education, manual therapy, and targeted exercise prescription to empower his clients to reach their goals and make a full return to function.